Early in the second half, Leighton trailed by only seven points before a succession of injuries left Buzzards playing with only 14 men. 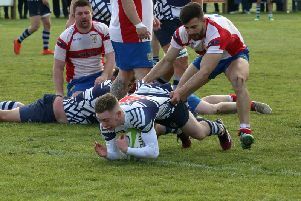 Already relegated, Leighton host their final Midlands 1 East game against Wellingborough next week before hosting Bedford Athletic in the Beds Cup Final on Thursday April 18. Having won the toss, Leighton chose to play into the wind and against the slope in the first half. Almost immediately Buzzards were under pressure and it took Towcester only three minutes to cross the line for their first try. With the successful conversion the home side led 7-0. Leighton responded straight from the kick off and, following a number of drives, Adam Stacey, who was to have an excellent game, crossed for Buzzards’ first try. James Brett’s conversion levelled the score at 7-7 after five minutes. Playing against the wind and up the slope, Buzzards were finding that whilst they could secure their set-piece ball, it was difficult to escape from their own half. As a result there was pressure on the defence which resulted in Towcestrians scoring two further tries in the 15th and 24th minutes. With both converted, the home side led 21-7. Despite these setbacks, the final ten minutes gave apparent cause for optimism for the travelling support. Leighton benefitted from a number of phases close to the line but were unable to score. Then Jack Whitehouse made an excellent break from his own half , linked with the supporting Harri Sayer, before winger James Pratt was tackled just short. The half ended with Buzzards on the attack again but without success, leaving the half-time score 21-7. Now playing down the slope and with the wind, Leighton were still very much in the game. This belief was enhanced five minutes into the second period when Adam Stacey broke clear from a lineout, 15 metres from the line, to score his second try. With James Brett’s conversion, Buzzards only trailed 21-14. This seven point gap was only to last five minutes as, with their first attack of the half, Towcester scored in the corner. With the excellent conversion added, the home side led 28-14. Again Buzzards attacked – and after 28 minutes Adam Stacey crossed the line for what would have been his third try. Photographs clearly show the ball grounded but the referee was unsighted and therefore adjudged held up. This misfortune was compounded by injuries to Reece Harris Smith, Jacob Murtagh and James Brett that left Buzzards with 14 men and uncontested scrums. With a defiant mixture of commitment and team spirit, the young Buzzard side did not concede until the 36th minute and then again with an interception try at the end of the game. These last two tries at the end of the match, when Buzzards were down to 14 men, gave the final score of 40-14 a slightly misleading impression.